CPO 3rd month Oct futures contract close RM32 points higher as compare to previous trading session to close at RM2145 with a total of 7,581 lots traded in the market. CPO price was traded higher as soybean oil and crude oil electronic were traded strong during trading hours despite crude oil was plunge during overnight closing. Technically, to our surprise, CPO price yesterday challenge resistance price at RM2140 region again and closed on RM2145 levels. Based our technical interpretations, our opinion suggests CPO price currently at the edge of deciding on CPO current trend as RM2180 was seen at critical resistance level in order for this bear market to stay intact. 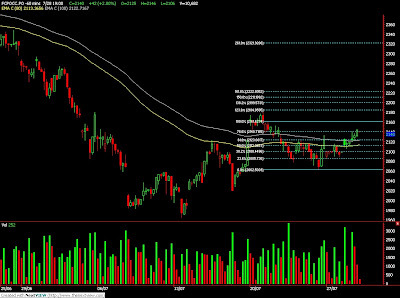 Traders were advice to only short position provided resistance levels at RM2162 and RM2180 were not violated. Support levels were seen at RM2120 and RM2090. FKLI July Futures contract rebound 2 points to close at 1163.5 levels as compare to previous trading session to with a total of 6,187 lots traded in the market. 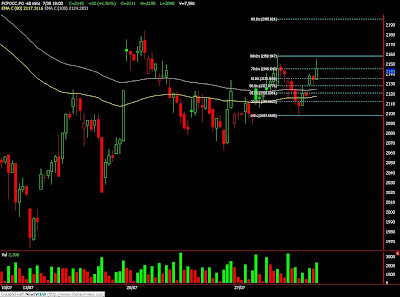 FKLI was traded sideways as regional indices were moving like a roller coaster during trading session. 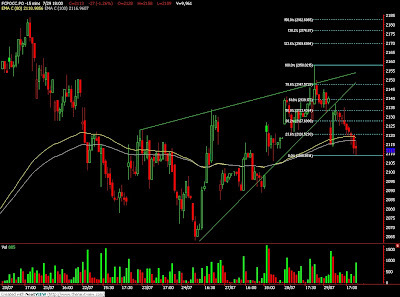 Technically, FKLI seems form a symmetric triangle in the hourly chart while Doji found in the daily chart. Based on our technical analyst, our opinion suggests FKLI would only trade lower provided symmetric triangle support levels at 1159.5 and 1153 were violated. Traders were advice only to hold short position once the support levels were violated while be cautious around resistance levels at 1174 and 1182 regions. FKLI July futures contract plunged 13 points lower as compare previous trading session to close at 1161.5 levels with a total of 13,074 lots traded in the market. FKLI was traded firm in the early trading session but plunge on 2nd trading session as Regional indices plunge sharply where China was the lead of the yesterday melt down. Technically, FKLI seems met objective price at 1182 at 250% Fibonacci projection levels and started traded lower once neckline at 1172 was penetrated. Based on our technical skills, our opinion suggests FKLI already enter the correction phase where next support seen at 1153 and 1145 levels. Traders were advice to hold short position in the coming trading session while be cautious around resistance levels at 1168 and 1174 regions. CPO 3rd month Oct futures contract close RM27 points lower as compare to previous trading session to close at RM2113 with a total of 9,961 lots traded in the market. CPO opened and trade firm but traded lower in the 2nd trading session as crude oil and soybean oil electronic trading were traded lower during the trading session. Technically, CPO again challenge and give false break signal at RM2162 resistance regions but traded lower once manage to break down from the rising wedge in the hourly chart. Based on our technical analyst, our opinion suggests CPO would continue traded lower in the coming trading session provided resistance levels at Rm2140 and RM2180 region were not violated. 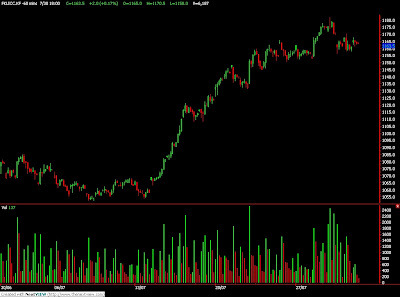 Traders were advice to hold short position while be alert around support levels at RM2090 and RM2063 regions. July 28 (Bloomberg) -- Gold fell the most in almost three weeks as the dollar rebounded against the euro, eroding demand for the metal as an alternative investment. Silver also declined. Gold and the dollar have moved inversely every month since April, resuming a pattern in five of the past seven years. The greenback rose as much as 0.7 percent against the euro, partly on revived demand for the safety of the world’s main reserve currency. Gold futures for August delivery dropped $14.60, or 1.5 percent, to $941.70 an ounce on the Comex division of the New York Mercantile Exchange, marking the biggest drop for a most- active contract since July 8. The price for immediate delivery slid 1.6 percent to $938.17 at 2:33 p.m. New York time. “Gold is just following the dollar,” said Afshin Nabavi, a senior vice president at MKS Finance SA in Geneva. Silver futures for September delivery dropped 25 cents, or 1.8 percent, to $13.74 an ounce, the biggest decline since July 10. Earlier, the U.S. Dollar Index, a gauge against six major currencies, touched the lowest this year. Gold climbed to an 11-month high in February as investors sought a haven against equity losses. The metal benefited as investors bought exchange-traded funds backed by bullion. In July, gold held in 15 ETFs has tumbled 26 tons, heading for the largest monthly outflow since April 2008, according to Barclays Capital. July 29 (Bloomberg) -- The yen extended its gain versus the euro before a government report that economists said will show orders for durable goods in the U.S. fell last month, curbing demand for higher-yielding assets. The dollar rebounded from the lowest level this year against the currencies of six major U.S. trading partners after a bigger-than-forecast drop in U.S. consumer confidence triggered a decline in stocks and renewed demand for the safety of the world’s main reserve currency. The yen rose for a second day against the Australian dollar after a report showed Japanese retail sales dropped for a 10th-straight month. The euro fell to 133.54 yen at 8:54 a.m. in Tokyo from 133.95 yen yesterday in New York. The dollar was at 94.39 yen from 94.55 yesterday, extending its drop this month to 1.8 percent. The euro slumped to $1.4146 from $1.4167 yesterday. The 16-nation currency traded in July in a range of $1.3833 to yesterday’s high of $1.4304, the strongest level since June 3. The Australian dollar fell to 77.76 yen from 78.18 yen yesterday in New York where it hit 79.30 yen, the highest since June 15. The yen rose against all of its 16 major counterparts tracked by Bloomberg on forecasts that U.S. orders for durable goods last month fell 0.6 percent, the first retreat in three months, according to a Bloomberg News survey of economists. The Commerce Department releases the data today. The Dollar Index, which the ICE uses to track the greenback against currencies including the euro, yen, pound and Swedish krona, advanced 0.2 percent to 78.974 today, recovering from a 0.4 percent decline to 78.315 yesterday, the lowest level since Dec. 18, after the Standard & Poor’s 500 Index decreased 0.3 percent following a two-week rally. Stocks declined after the New York-based Conference Board’s U.S. consumer confidence index dropped to 46.6 following a reading of 49.3 in June. The median forecast of 67 economists surveyed by Bloomberg News was for a decrease to 49 this month. Adding to the global gloom, retail sales in Japan slid 3 percent in June from a year earlier following a 2.8 percent drop the previous month, the Trade Ministry said today in Tokyo. Economists surveyed by Bloomberg News predicted a decline of 2.5 percent. Federal Reserve Bank of San Francisco President Janet Yellen said the U.S. economy’s expected recovery is likely to be “painfully slow” as consumers spend less and save more. She also said the U.S. is showing the “first solid signs” of emerging from recession. “A gradual recovery means that things won’t feel very good for some time to come,” Yellen said in a speech in Coeur d’Alene, Idaho. CPO 3rd month Oct futures contract close RM42 points higher as compare to previous trading session to close at RM2140 with a total of 10,682 lots traded in the coming market. CPO opened and trade firm during trading session despite not much volatility from soybean oil and crude oil electronic performance. Technically, CPO challenge critical resistance levels at RM2140 regions twice during trading session after break up from previous high levels at RM2134 regions. Based on our technical point of view, our opinion tells CPO showing sign of bullishness and further confirmation if manage to breach resistance level at RM2140 and RM2180. Traders were advice to stay out from the market for further confirmation on the trend directions. Support levels were seen at RM2120 and RM2090 regions. FKLI July futures contract surge 18 points higher as compare previous trading session to close at 1174.5 level with a total of 8,748 lots traded in the market. FKLI was traded higher mainly due to strong regional indices performance especially Hang Seng indices during the trading sessions. Technically, FKLI false break lower in the earlier session and traded higher after manage to breach the resistance trend line in the hourly chart. 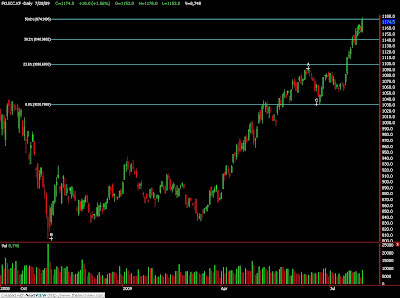 Based on our technical analyst, our opinion suggest FKLI would is possible to reach 50% Fibonacci projection levels at 1176 regions while next resistance shall be seen at 1209 levels. However, traders were advice to hold short position in the coming trading session if 1180 levels were not violated while be alert around support levels at 1153 and 1145 level. July 27 (Bloomberg) -- Cash premiums for soybeans delivered at export terminals near New Orleans widened for the first time in two weeks against Chicago futures on speculation that China, the biggest global importer, will buy more U.S. supplies. The so-called spot-basis bid, or premium, offered for soybeans sent by barge to the New Orleans area in July was 65 cents to 68 cents a bushel above the price of futures for August delivery on the Chicago Board of Trade, compared with 65 cents to 66 cents on July 24, U.S. Department of Agriculture data show. The bid widened for the first time since July 10. The average basis rose from a one-month low, gaining 1 cent to 66.5 cents, according to the USDA. U.S. export prices are about 80 cents a bushel cheaper for delivery to China next month compared with offers from Brazil, the world’s second-biggest exporter after the U.S., said Charlie Sernatinger, a market analyst for Fortis Clearing Americas LLC in Chicago. U.S. prices are $1 cheaper than soybeans sourced from Brazil for shipment in October, Sernatinger said. Some farmers in the southern U.S. begin harvesting in late August, increasing inventories the government says will fall to the smallest in 32 years by Aug. 31. It is still cheaper for some oilseed processors in China to import supplies from the U.S. than to purchase domestic inventories, Sernatinger said. China will auction 500,000 metric tons of soybeans from state stockpiles tomorrow, the National Grain & Oil Trade Center said on its Web site July 24. The government failed to find any buyers for about 500,000 tons it offered for sale last week because prices were above the cost of importing supplies. “If no takers are found, the government is expected to try to subsidize sales next week,” to empty state-owned coffers to prepare for the Chinese harvest in October, Sernatinger said. July 27 (Bloomberg) -- Soybeans dropped for a second straight session on speculation that rain will improve development of the second-biggest U.S. crop, which had been stunted by dry conditions during the past month. Most Midwest fields will receive normal to above- average rainfall during the next week, said Mike Tannura, a meteorologist at T-Storm Weather in Chicago. Farms from Texas to Georgia may receive more than five times the normal rainfall in the next five days, boosting depleted soil moisture, Tannura said today in a note to clients. Soybean futures for November delivery fell 8.5 cents, or 0.9 percent, to $9.065 a bushel on the Chicago Board of Trade. Last week, the price dropped 0.9 percent. Soybeans are the second-biggest U.S. crop, valued last year at $27.4 billion, government figures show, behind corn at $47.4 billion. The U.S. is the world’s largest producer and exporter of both commodities. July 27 (Bloomberg) -- Gold futures climbed in New York as the dollar retreated, supporting demand for the precious metal as an alternative investment. Silver also gained. The dollar dropped to a seven-week low against a basket of six major currencies. Gold gained 4.8 percent in the previous two weeks as the greenback dropped 1.8 percent. Purchases of new homes in the U.S. jumped 11 percent in June, the biggest gain in eight years, government data showed today. A “positive economic outlook” and the sliding dollar are “slightly bullish” for gold, Societe Generale analysts in London said in a note. Gold futures for August delivery gained 40 cents to $956.30 an ounce on the Comex division of the New York Mercantile Exchange. Earlier, the price reached $962.70, the highest for a most-active contract since June 11. Gold for immediately delivery climbed $3.17, or 0.3 percent, to $954.52 at 3:04 p.m. New York time. Silver futures for September delivery gained 11.5 cents, or 0.8 percent, to $13.990 an ounce. Gold and the dollar have moved inversely every month since April, resuming a pattern in five of the past seven years. “Gold’s continued consolidation above $947 suggests further upside momentum,” said Ralph Preston, a Heritage West Futures Inc. commodity analyst in San Diego. Earlier, gold futures dropped as much as 0.6 percent. Holdings in the SPDR Gold Trust, the biggest exchange-traded fund backed by bullion, are down more than 3 percent this month, signaling investors may be shifting to other assets. Silver futures have climbed 24 percent this year, and gold is up 8.1 percent. July 28 (Bloomberg) -- The dollar may fall for a third day against the euro on speculation Asian stocks will extend a global rally on signs the economy may be shaking off the worst recession since World War II, sapping safety demand. The greenback traded near the lowest level this year against the currencies of six major U.S. trading partners including the euro as a report showed sales of new homes rose last month by the most in eight years. The yen fell against most of its major counterparts as analysts raised their profit estimates for U.S. companies for the first time since 2007. The dollar was at $1.4237 as of 8:07 a.m. in Tokyo from $1.4232 yesterday when it touched $1.4298, the weakest level since June 3. The Dollar Index, which the ICE uses to track the greenback against currencies also including the yen, pound and Swedish krona, touched 78.396 yesterday, near this year’s low of 78.334 on June 2. The euro rose to 135.60 yen from 135.48 in New York where it hit 136.10 yen, the highest since July 2. The yen was at 95.25 from 95.18 yesterday when it reached 95.38, the lowest since July 7. The yen traded near the lowest level in almost three weeks against the dollar before a report that economists said will show U.S. home prices fell at a slower pace in May, adding to signs that the American economy is stabilizing. The S&P/Case Shiller index of 20 major metropolitan areas, due July 28, will probably show property values fell 17.9 percent in May from a year earlier, according to a Bloomberg News survey of economists. The measure was down 18.1 percent in the 12 months ended April. Wall Street firms raised profit forecasts on companies listed on the Standard & Poor’s 500 Index 896 times in June and lowered them 886 times, according to data compiled by JPMorgan Chase & Co. The last time analysts were bullish on a net basis was in April 2007. The yen and the dollar may fall after the Nikkei 225 Stock Average completed yesterday a ninth-straight trading day of gains, the longest stretch in over 21 years, boosting demand for higher-yielding assets in resumed carry trades. In carry trades, investors borrow at a low rate in one country and invest in another nation with higher returns. Benchmark interest rates of 8.75 percent in Brazil and 0.25 percent in Sweden compare with 0.1 percent in Japan and as low as zero in the U.S.
FKLI July futures contract close marginally 0.5 point lower as compare previous trading session to close at 1156.5 level with a total of 4,193 lots traded in the market. FKLI was traded without any direction during entire trading session despite regional indices and Dow Jones electronic trading were traded firm throughout the entire trading session. 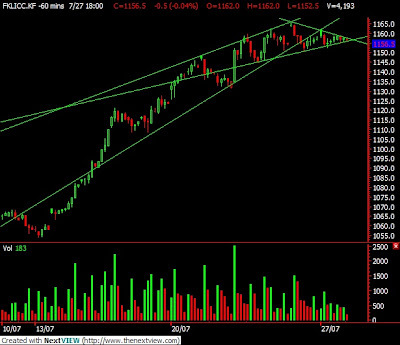 Technically, FKLI seems formed at symmetric triangle formation in the hourly chart after fall out from the rising wedge formation during last week. Based on our technical analyst, our opinion suggests FKLI would trade lower in the coming trading session provided resistance levels at 1164 and 1171 were not violated during market trading hours. 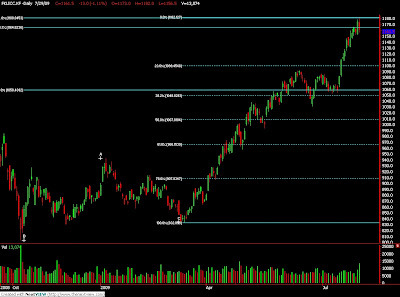 Traders were advice to hold short position once support levels at 1151 and 1145 were breached. CPO 3rd month Oct futures contract close RM24 points lower as compare to previous trading session to close at RM2098 with a total of 6,514 lots traded in the coming market. CPO price were traded lower due to weak soybean oil overnight and electronic trading despite CPO sudden spike up during last week trading. 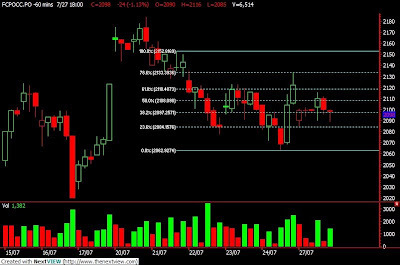 Technically, CPO price seems temporary topped around 78.6% Fibonacci retrace level at RM2134 regions but further confirmation only if manage to breach support levels at RM2090 and RM2063 regions. Based on our technical analyst, our opinion suggests CPO price still riding on a bear market with short term support level seen at RM2060 and RM2000. Traders were advice to hold short position in the coming trading session provided resistance levels at RM2116 and RM2134 were not violated. MUMBAI, July 27 (Reuters) - Indian soybean futures were lower on Monday tracking weak Malaysian palmoil, analysts said. At 10:50 a.m, the August soybean contract NSBQ9 on the National Commodity and Derivatives Exchange was at 2,223.5 rupees per 100 kg, down 0.40 percent. The benchmark October palm oil futures KPOc3 on Bursa Malaysia Derivatives Exchange was at 2,099 ringgit a tonne, down 1.08 percent at 10:50 a.m. Soybean and palmoil are related commodities and their prices often move in tandem. July 27 (Bloomberg) -- Palm oil futures dropped for the first time in three days on speculation that lower soybean and soybean oil prices may erode demand prospects for the commodity. Soybean prices in Chicago fell 0.9 percent last week on expectations that cool weather and rain will boost yields in the U.S. and soybean oil lost 2.6 percent. Palm oil competes with soybean oil in cooking oil and biofuel. Palm oil was under pressure after soybeans and soybean oil declined last week, said Ben Santoso, an analyst at DBS Vickers Securities (Singapore). Still, rising crude oil prices would limit any future decline in palm oil, he said. October-delivery palm oil fell as much as 1.7 percent to 2,085 ringgit ($591) a metric ton on the Malaysia Derivatives Exchange and was at 2,099 ringgit by 11:44 a.m. local time. The vegetable oil has declined 5.9 percent this month, heading for a third such drop. Palm oil ended little changed last week on renewed concerns that record stockpiling this year by China and India, the largest consumers, will damp export orders when the peak seasonal demand period concludes. There is “further downside potential of crude palm oil prices as current stockpiles continue to accumulate at record high levels, largely in China and India,” UOB Kay Hian (Malaysia) Holdings Sdn. said a report on July 23. Prices of palm oil could drop to 1,900 ringgit a ton this quarter, lower than an earlier estimate of 2,000 ringgit a ton, the report said. Soybean oil for December delivery was up 0.2 percent at 34.66 cents a pound at 11:54 a.m. Singapore time after losing 2.2 percent on July 24 on the Chicago Board of Trade. Futures are trading at a 28 percent premium to palm oil, down from 51 percent in January, according to Bloomberg data. September-delivery crude oil was up 0.8 percent at $68.58 a barrel by 11:58 a.m. Singapore time on the New York Mercantile Exchange after gaining as much as 82 cents to $68.87, the highest intraday price since July 2. Malaysia’s palm oil exports rose 9.9 percent in the first 25 days of July compared with the same period the previous month, according to independent surveyor Intertek. A total of 1,117,848 tons of palm oil were tracked July 1-25, Intertek said in a report today. Malaysia exported 1,017,105 tons of palm oil in the same period in June, the surveyor said. “The rise in Malaysia’s exports was largely within market expectations,” Santoso said. July 27 (Bloomberg) -- Crude oil rose to the highest in more than three weeks after investors sought commodities as a hedge against inflation as the dollar traded near a seven-week low against the euro. Crude oil for September delivery gained as much as 60 cents, or 0.9 percent, to $68.65 a barrel in after-hours electronic trading on the New York Mercantile Exchange. That’s the highest intraday price since July 2. It was at $68.42 a barrel at 9:25 a.m. in Singapore. The contract earlier fell as much as 0.5 percent to $67.68 a barrel. July 27 (Bloomberg) -- The dollar traded near the lowest level in seven weeks versus the euro before a report economists said will show new home sales rose in the U.S., adding to signs that the global economy is stabilizing. The Australian dollar approached the highest level in more than three weeks against the yen after Asian stocks extended a global equity rally, adding to evidence investors are shifting to higher-yielding assets. Futures traders increased bets that the euro and Australia’s dollar will gain against the U.S. currency, as the risk appetite increases. The dollar was at $1.4201 per euro as of 9:51 a.m. in Tokyo from $1.4202 in New York on July 24. It touched $1.4291 on July 23, the weakest level since June 3. The yen was at 134.71 against the euro from 134.63 on July 24. Japan’s currency fetched 94.86 versus the dollar from 94.79. Australia’s currency was at 77.57 yen from 77.46 yen in New York on July 24. The currency reached 78.04 yen on July 23, the highest since July 2. The yen fell against 12 out of the 16 most-active currencies tracked by Bloomberg. A U.S. government report will likely show new home sales rose 2.9 percent in June to a 352,000 annual rate, according to a Bloomberg News survey of economists before the release today. Home prices continue to fall, albeit at a slower pace. The S&P/Case Shiller index of 20 major metropolitan areas, due July 28, will probably show property values fell 17.9 percent in May from a year earlier, according to the median forecast. The measure was down 18.1 percent in the 12 months ended April. Futures traders increased bets that the Australian dollar will gain against the U.S. dollar, figures from the Washington- based Commodity Futures Trading Commission show. The difference in the number of wagers by hedge funds and other large speculators on an advance in the currency compared with those on a drop -- so-called net longs -- was 38,788 on July 21, compared with net longs of 25,593 a week earlier. The MSCI Asia Pacific Index of regional shares rose 0.9 percent, while the Nikkei 225 Stock Average added 1.8 percent. The difference in the number of wagers on an advance in the euro compared with those on a drop was 34,772 on July 21, compared with net longs of 13,899 a week earlier. Futures are agreements to buy or sell assets at a set price and date. The figures reflect holdings in currency-futures contracts at the Chicago Mercantile Exchange as of July 21. The dollar also strengthened on speculation foreign investors will buy some of the $115 billion in Treasuries which the U.S. will sell this week. Bernanke’s comments came before U.S. officials including Treasury Secretary Timothy Geithner meet with Chinese counterparts today and tomorrow in Washington to discuss economic and strategic issues. A stronger U.S. economy would bolster the dollar, Bernanke said yesterday in Kansas City, Missouri, in a town-hall-style meeting taped for broadcast on PBS television this week. He also said he expects the economy to grow at an annual rate of 1 percent in the second half, while unemployment will exceed 10 percent before beginning to decline.